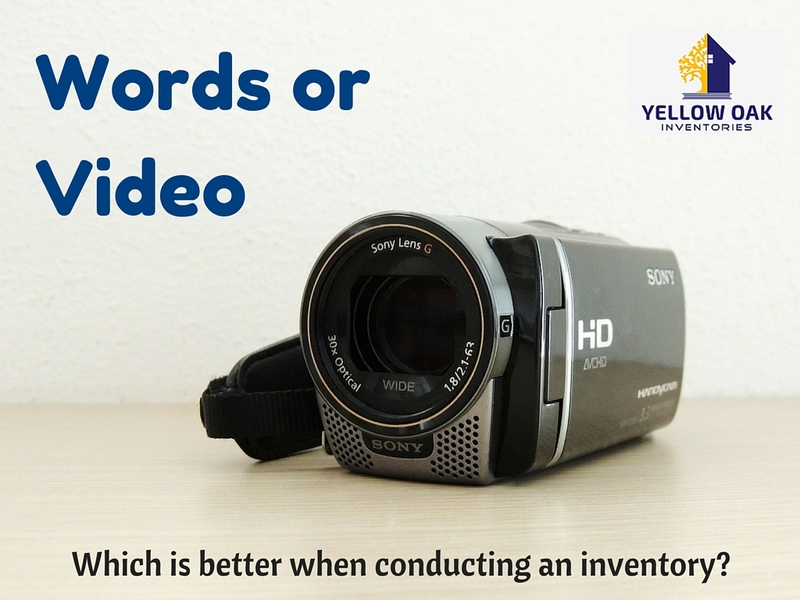 Words or Video – Which is better when conducting an inventory? There is an ongoing debate between landlords, agents and inventory clerks to whether words or video are better, when conducting an inventory. Did you know that adjudicators actually prefer words to video in dispute cases? Well firstly, statements issued by both the TDS and MyDeposits make it very clear that written evidence (in the form of a detailed inventory and check out report) is still paramount to allow adjudicators to give a fair judgement. The majority of us love new technology, as it’s a great time saver for many tasks. BUT sometimes it’s not always the answer and this is the case with property inventories. This is because a video relies on the adjudicator having the correct equipment to view it. They will also need patience to sift through potentially hours of footage to find the part that covers the dispute. A good video will also need to be supported by a detailed narrative throughout the recording, to explain to the adjudicator what exactly they’re looking at and what for. Digital recorders make dictating and transcribing an inventory a much faster and easier process too. In the last couple of years letting agents have actually been warned by the Association of Independent Inventory Clerks about replacing essential written inventory descriptions for digital evidence, as it leaves their landlord clients vulnerable to potential disputes further down the line. At Yellow Oak Inventories we completely agree with the associations’ statement that photographs and video can provide a good illustration, but are not at all helpful without a detailed written inventory firmly in place. I’m sure you’ve heard the saying ‘a picture is worth a thousand words’, however this is certainly not the case with a residential inventory report. Photographs alone, even with the date and time of day clearly shown, will provide no context whatsoever if they’re not accompanied by a written inventory. This is where the help of a fully qualified, trained and experienced independent inventory clerk comes into play. As a landlord it shouldn’t be about getting the cheapest deal around, but about finding the best deal that’s going to protect you in the future should a dispute arise. So in conclusion, at Yellow Oak Inventories we believe that words are far substantial when you are carrying out an inventory, but will be made stronger accompanied by good photographs and a well narrated video. Please get in touch with one of our friendly team today – either by phone: 020 3713 4933, by email: info@yellowoak.co.uk or via Facebook or Twitter.